Social finance is about ethical investment, coupled to returns that maximise social equity and outcome, whilst providing returns, albeit of a softer maturation than traditional investment vehicles. There is a new market-place for matching socially positive investors with enterprises who embrace the social return in parallel with the financial…the social stock exchange. They meld with the mainstream financial markets in a variety of ways, or run ‘independently’. Evidence of this early stage development is illustrated by, in the cases we review, that there appears to be no single cross border, cross discipline framework with regard to governance, recognised standard fees or standardised cash holdings to support investment. Some operate in developed markets, others in emerging and frontier zones. A good, standardised assessment methodology for both social and environmental positive impact already exists, Read more about GIIRS, (pronounced ‘gears’), a Pennsylvania based not for profit organisation with a world view. Could a similar system be invested to measure social finance market makers too? None the less, a clear emergence of a trade/invest market for the socially minded investor can only be a good thing, we would argue. This not for profit company believes it should help make money do good. Based in Oxford, UK the Ethex team strive to inform and support positive investors in identifying and investing in companies with strong social outcomes as part of their delivery. Ethex believes that all money should do good – not only financial good, but also making the world a better place. That means investments that deliver social and environmental benefits, not just financial ones. Sadly, this is not true for the majority of financial products. Currently financed from a variety of charitable trusts, Ethex is supported by The Tudor Trust, Esmee Fairbairn Foundation, The Big Lottery Fund and others, with plans to become self sustaining as their investment portfolio grows. (Ethex are open about the charges to both investor and companies seeking investment, as well as salary levels in their organisation). Investors can discover and create portfolio from as little as £10. Read more about Ethex here..
Based in the City of London, this company is located and mirrors quite closely a traditional financial market matrix, featuring London Stock Exchange listed companies with social drivers. At the Social Stock Exchange we connect Social Impact Businesses with investors looking to generate social or environmental change as well as financial return from their investment. We believe that robust revenue and growth businesses with social and environmental aims at the core of their activities are best equipped to generate positive change. We call these Social Impact Businesses. Moving away from the UK into the global arena for Social Finance there a number of market making organisations in our sector who focus on Africa and Asia, not Western Europe. This organisation is a market gateway for Africa and Asia, an access point to social enterprises seeking social market listing/capitalisation which is managed by the Stock Exchange of Mauritius (SEM). By taking the lead in supporting Impact Exchange, SEM is working to ensure that the capital markets actively provide the infrastructure and systems necessary to create an organized, fair and regulated market that will bring Impact Issuers and Impact Investors together from across the globe. SEM is fully supportive of the vision of “”Maurice, Ile Durable” (“Mauritius, sustainable island”)”, and supports the emergence of Mauritius as sustainable island by providing a global marketplace to support sustainable investment for social and environmental impact throughout the continent, the Asia Pacific and beyond. The Exchange has a non – profit arm, Shujog, which provides practical operational help for social enterprises in the market’s area of interest, as well as playing a key role in developing impact assessments to evidence the social value for both the enterprise and the socially minded investor. 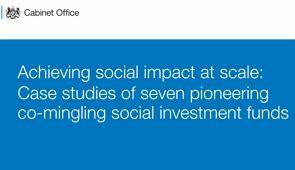 Further evidence that mainstream financial institutions, as well as traditional trust funds, are bending more towards social finance and impact investment opportunities is evidenced in a recent Cabinet Office report on Achieving Social Impact at Scale: co-mingling social investment funds. This report from the Spring of 2013 offers the reader case studies of seven international projects which have taken a layered and differentiated approach to social investment, including in the UK some key Trust funds. This co-mingling of funds, layering of risk and return at stepped levels – coupled to a new social investment and impact recognition market place – all indicate that social finance as an emerging market sector has an ever increasing means of recognising opportunities and in refracting often competing investment needs through the co-ordinating lense of social outcome. 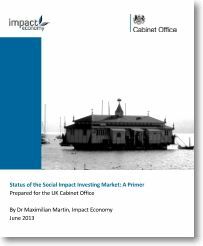 Becoming generally available from the Cabinet Office in July 2013, the analysis of the social impact market by Maximilian Martin, Status of the Social Impact Investing Market: A Primer, sets the scene well regarding the subtle shape of the market and how a whole new eco-system of investors and vehicles for their capital have emerged, and are still emerging, into this relatively new field. We recently published an article featuring the latest report from New Philanthropy Capital, Best to Invest, which we stressed was a primer for the structure of the UK social investment market. You can read more here. The Martin position paper in this article looks at the broader, global context of the social impact investing model and examines the origins of the market meta-structure across the globe, with some interesting analysis on the developing gap between public demand for new social investment and the ‘public’ finance shortfall in meeting it. This huge gap, Dr. Martin argues, is ripe for topping up by private capital, or capital from non-traditional sources, which deployed by the social outcome minded investor can transform community landscapes – in both the developing and developed world. Based on recent studies by Accenture and Oxford Economics, the projected public services world expenditure gap is of enormous proportions through to the year 2025. The Canadian shortfall estimated is 90 billion US Dollars (USD). the German gap some 80 billion USD and the UK expected need is for an additional 170 billion USD in investment over the same period. This pan-global approach is interesting, in that the Martin paper shows, that when seen globally, responding to social investment demands can stimulate traditional and mainstream market provider outputs. Martin quotes the example of the French company, EDF, who in 2002 began a programme of investment in Morocco to bring electricity to the 10% of the country’s population with no access. to power. EDF’s innovative partnerships brought dividends in market development, new market creation ideas based on its approaches to the Moroccan market and proved the power of public/private partnerships for them and their shareholders. 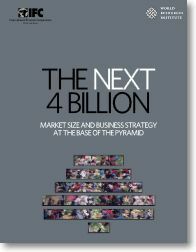 The problem they were trying to solve was, according to Martin, the pent up demand generated in all economies by the ‘Bottom of the Pyramid’ (BoP). 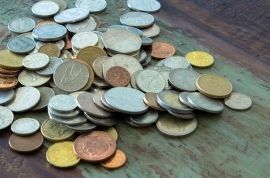 Martin argues that the efforts of the World Bank, pan global organisations and national governments have failed to eradicate the contentious issue of millions of humans living on less than 2 USD per day. In economies, scale is everything, and whilst veering away from any descriptor of communities as a residuum of society, a deeply negative, high Victorian view of the pryramidal effect of social and economic power and facility, the Martin model also has resonance for local communities in the UK, we would argue. If innovation and bold thinking about investment, the risk supported and partially mitigated by mainstream government infrastructures, then change and transformation in societies where the median income level is significantly higher than 2 USD per day, where educational and functioning literacy levels in matters economic are that much higher – surely we can use social finance to turn the pyramid upside down? Read the Cabinet Office primer and let us have your take on the global narrative too!